Express Transindo Utam is by far the Top 2 taxi company in Indonesia. 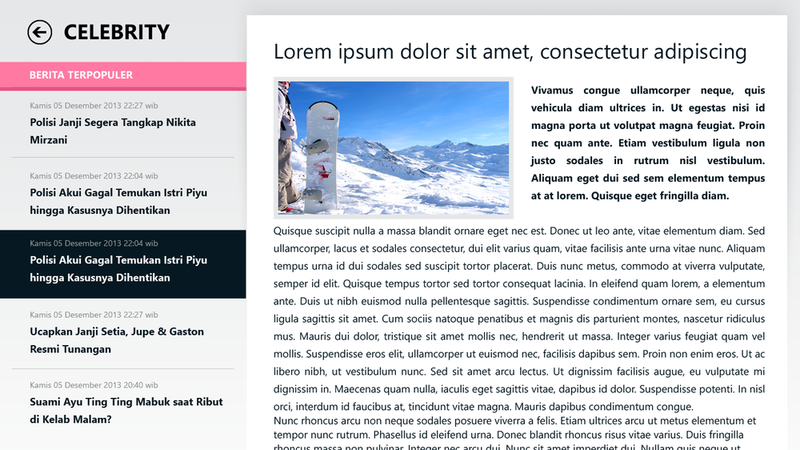 Above is the initial mockup designs I've created for both platforms. Features will include mobile reservation for Regular/ Exclusive Taxis, location tracking of the ordered taxi's current position, and service rating to enhance the overall experience. Windows 8 version will follow. Bussan Auto Finance (BAF) is one of Indonesia's leading and reliable financing company for customers, business partners and communities who wish to apply for credit financing on Yamaha motorcycle. Daily, there are tons of surveyor taking new applications manually using paper and pen, and eventually the customer had to fill in over 400 survey questions which really takes time. This initial mockup design is proposed as an solution to transform the survey system into a simplified digital version, in which surveyors will be able to check Survey Dashboard updated daily and do related course of actions regarding different status on their Task List, all using their Windows Phone. This app will be deployed internally and the actual design process is under NDA. Info BCA is a product sibling of the earlier launch of “BCA Mobile”, an application designed to simplify your banking transactions in Bank Central Asia, one of the biggest private bank in Indonesia. With this informational app you can access all information you need, such as: BCA Promo, all promotions related to your BCA cards (Kartu Kredit, Debit, Flazz, etc) and other BCA products/programs; Mini Gallery, a catalogue of BCA products which can be directly ordered from your smartphone; Online Application, BCA credit card application form; BCA ATM and Branch Locator, a feature to find the nearest location of BCA ATMs and branches; Reward BCA, information of your Reward BCA total points and where you can exchange it; and direct connection to Halo BCA by phone. This is the initial design mockup for Trakindo's AR (Augmented Reality) experimental project. 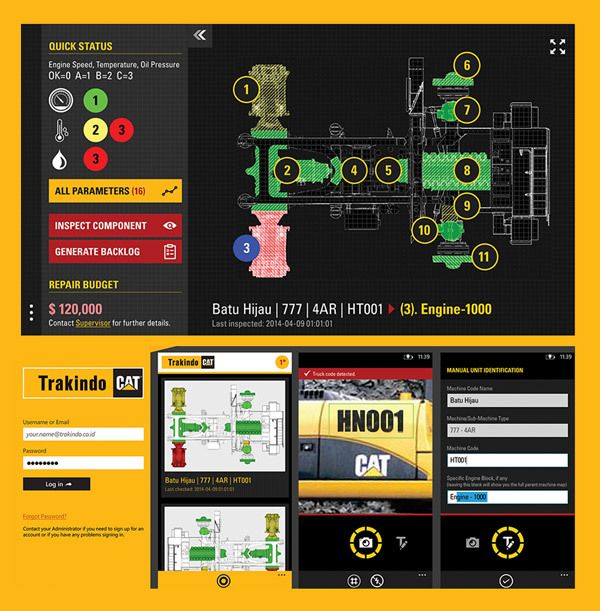 Basically it's an application to scan truck units based on its unique ID and then view its component's status for each record parameters (such as engine speed, temperature, and oil pressure). The machine's viewport is currently rendered in 2D but we're bringing 3D into consideration on future implementation. Targeting Windows Phone handheld with 6" screen which is perfect for outdoor and be used by field workers reporting real time status and issues. This not is being deployed internally and I only joined the project in the initial early stage. 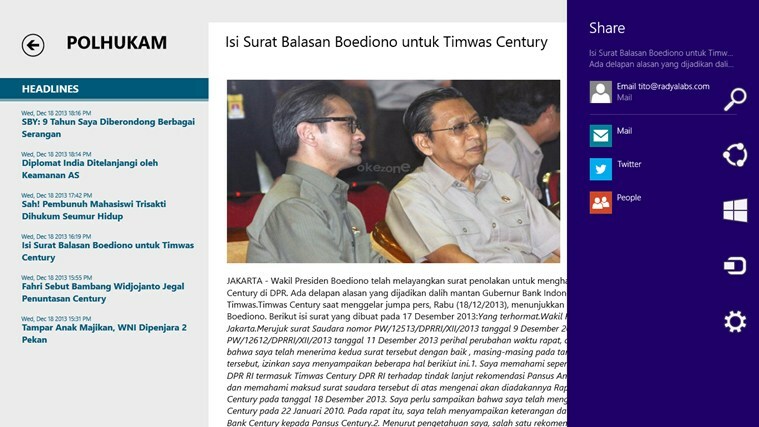 The official MetroTV News application for Windows 8 is now available. Get both national and international news update with the most accurate and fastest way. Also featuring the latest videos and access to all Metro events through your Windows 8 device. This application allows you to access news headlines any time from all available news categories: technology, politics, entertainment, humanities, sports, etc. In addition, you can also live stream news and events on the selected famous talkshows such as Mata Najwa, Kick Andy, etc. Citilink is a low-cost airline headquartered in Jakarta, Indonesia. 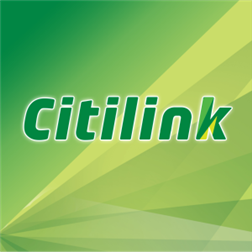 Established in 2001 as a low-cost subsidiary of Garuda Indonesia, Citilink is set up to operate shuttle services between domestic flights, mainly connecting the 5 main islands all across Indonesia. 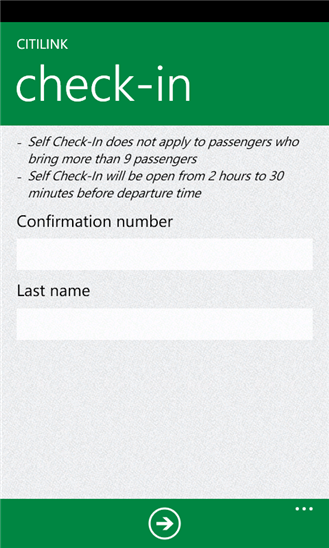 Above is the initial version of the Main Hub mock-up design for Citilink app for Windows Phone, a joint development with Citilink Indonesia and Armanovus Team. 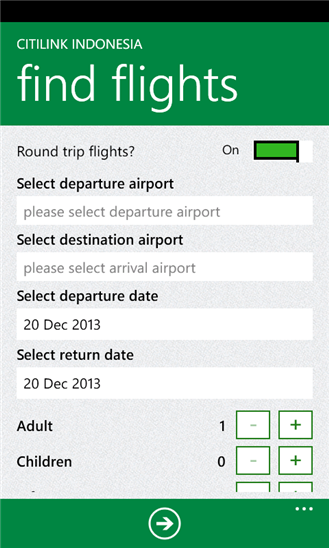 You can use the app to help you book flights, manage your booking, and do mobile check-in right from your smartphone. Okezone is a one-stop news and entertainment online portal established in 2006 under PT. Media Citra Nusantara (MNC), the same group who owns several giant television, print media and radio business in Indonesia such as RCTI, Global TV, Koran Sindo, and Global Radio. With frequent updates going for 20 minutes - 1 hour interval, Okezone is one of the most updated news channel that covers more than 12 categories, including Economy, Celebrity, Sports, Music, Lifestyle, etc. 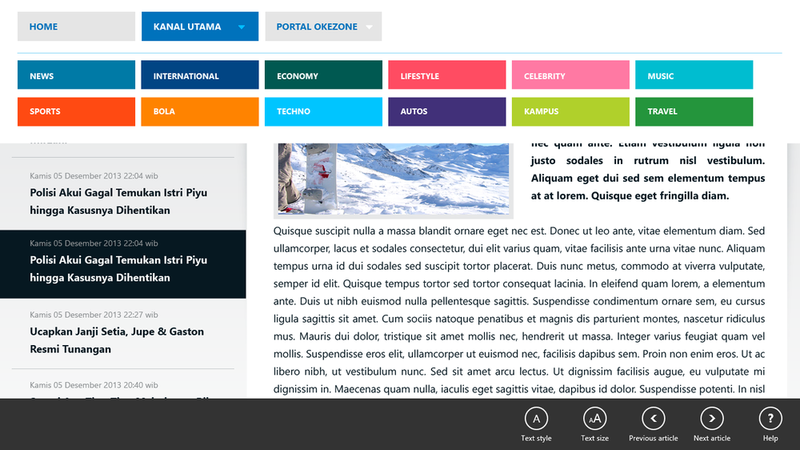 Now that it is available on Windows Store, Windows 8 users can install the application on their notebook/tablet to enjoy a new and beautiful reading experience. This app is a joint development with Radya Labs. Its Windows Phone version will soon be available at the store as well. 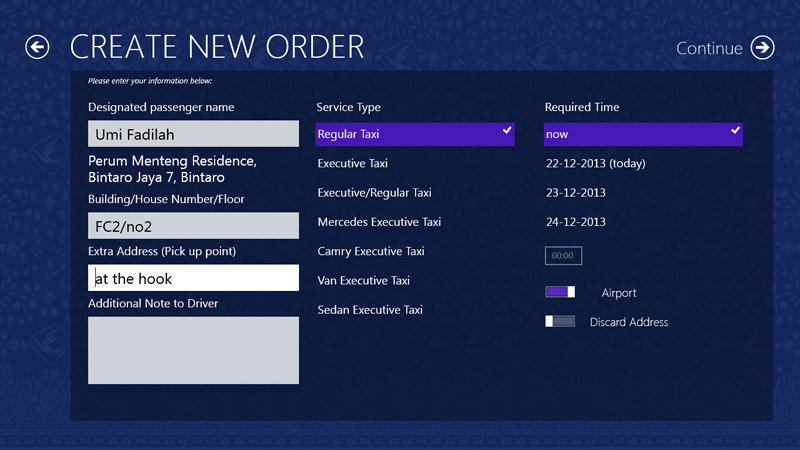 This app helps you to make taxi reservation easier in Indonesia, right from your Windows 8 tablet/notebook/PC. Blue Bird Group is the largest taxi operator and by far the most preferable taxi choice in most of the large cities in Indonesia, serving more than 8.5 million passengers per month across the country. Please note that users will need Indonesian phone number to register, also an input verification code that Blue Bird sent upon using the service. It also provides tracking features to show your taxi position on the map. The taxi search will be done with the closest taxi available around. This app is a joint development with Armanovus. Kaskus is an Indonesian internet forum site established in the United States on 1999 by several Indonesian students. It was originally intended as an informal forum of Indonesian students abroad. The name "Kaskus" itself is an abbreviation of the word "Kasak-Kusuk". Now, rapidly growing with over millions of active users per month, Kaskus is without a doubt the largest Indonesian online community. There are hundreds of forum categories, services (KasPay, ePulsa, Kaskus Ads, etc), and business transactions valued at billion rupiahs are rotating every day via online merchant selling goods/services. 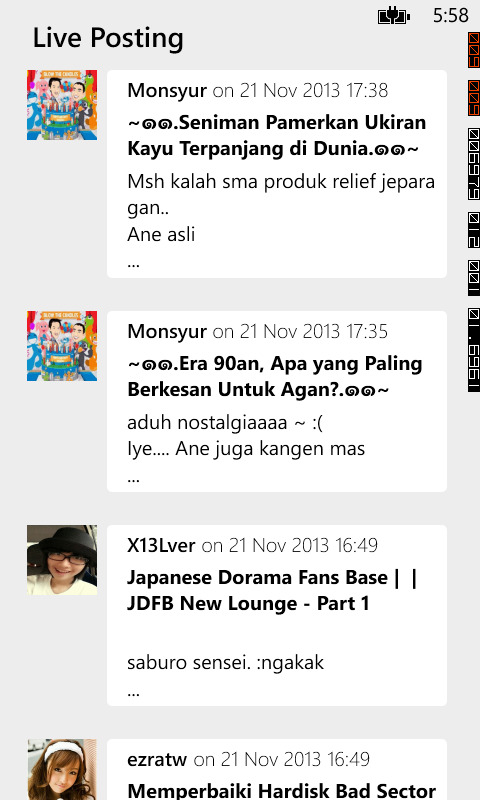 This app provides one of the quickest and most convenient way to browse the entire forum. Malebanget.com (MBDC) is an Indonesian humor website established in 2002 that focuses on funny pictures, online videos, and web series. The website name itself actually means “very lazy”. With constant creative content production and online publishing, MBDC is growing steadily passing their eight digit traffic. That could only mean something: People love jokes from the internet. The MBDC mobile app for Windows 8 enables you to enjoy humor on the go via tablet.